The technique for applying the actual hook-set when a steelhead takes a fly varies depending on the drift presentation being used. The “takes” when dead-drift nymphing are usually very subtle and difficult to detect at times, especially in cold, late fall and winter tributary flows. Experienced steelheaders often “lift up” and set the hook as a “sixth sense” reaction when the drift seems different. The beginner is best advised to react on anything that may seem to be a strike, like any hesitation, stop, or movement of his leader/fly line or floating indicator (this is obviously not a snagging movement). At times this could merely indicate fly-split-shot contact with the stream bottom, but it is not worth missing a real take. It is also important not to hesitate on the strike when nymphing since steelhead will often quickly spit out a dead-drifted fly after he senses it is not the real thing. A swift, hard hook-set is important especially when compensating for the give in more moderate-action, nymphing fly rod blanks. Pulling up and slightly downstream (steelhead typically hold on the stream bottom facing the current) helps prevent pulling the fly out of the fish’s mouth when setting the hook. After the strike, the fly fisherman simply raises the rod up, and to the side, and the steelhead will essentially hook himself. It is typically a very solid hook-up in the corner of the steelhead’s mouth, particularly if the steelhead takes the fly from the side. The solid hook-set, in combination with the heavier tippets, bigger hooks and beefier fly rods often used when swinging flies (versus nymphing techniques), very few fish are lost in this method. Once hooked, fall and spring steelhead often go ballistic and accelerate on a drag screaming run with a few cartwheels thrown in for good measure! To absorb these surges keep your fly rod high and immediately reel any slack fly line onto the reel. Use the drag of the reel, setting it light enough to prevent your tippet from breaking but heavy enough to put steady pressure on the fish and slow the fish down initially. Early in the fight, let the steelhead take out line on its runs and surges while maintaining a tight line with light to moderate pressure. Eventually the steelhead will begin to settle down. This is a signal to begin “working” the fish by applying heavy pressure. Pull the rod upward toward you and reel line in as you move the rod down towards the fish. This is called “pumping” the fish. It is possible to reel in a steelhead using this technique, but it is very time consuming because of the size of these fish and their fighting ability. Also, fighting a steelhead in this fashion can exhaust a steelhead even to the point of death particularly when using lighter tippets. To more effectively work a steelhead, alternately turn your rod form side-to-side, dropping it parallel to the stream, while continuing to pump the rod. This side position of the rod will throw a steelhead off balance and cuts in half the time it takes to reel him in, and the fish will be in much better condition upon release. If after hooking a steelhead, it moves either downstream or upstream a great distance, it is advisable to follow the fish to avoid excessive fly line getting into the water. The more fly line in the water (especially in fast current flows) the more additional pull or drag you will have to fight. Eventually, try to move the steelhead into slower water where the current effects are minimized. When a steelhead is close enough to be netted, bring your rod up to the vertical position. In this upright position, your rod will absorb any unexpected surges or runs. These can occur when a steelhead rubs his belly on the stream gravel along the shore or sees your buddy approaching with the net in the water. When you can turn the steelhead on its side and move its head toward the surface, it is a signal that the fish is tired and ready to be netted. Keep the net stationary in the water and guide the steelhead into the net. Use a large steelhead-size net and net the fish head first. 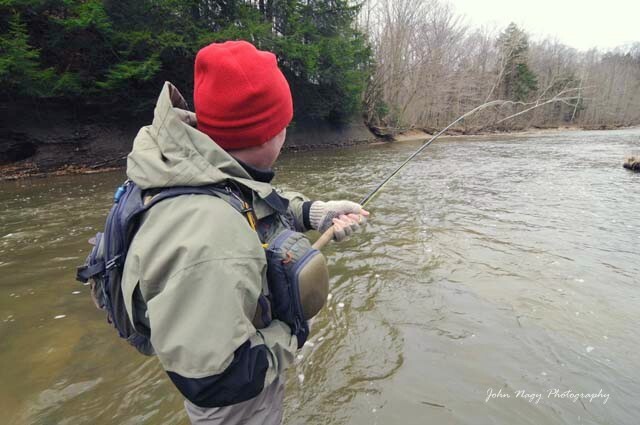 Avoid jabbing the net at the steelhead (especially if it is still active). 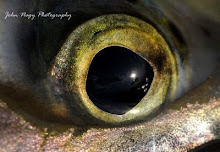 This sudden movement could knock the hook out of fish’s mouth or cause it to bolt suddenly resulting in a break-off. To practice good catch-and-release technique always keep the fish in the water when removing the hook and taking the obligatory “grip and grin” photo. Before releasing the steelhead make sure it is strong enough to swim away on its own and position itself back in the current flow. Tippet material and knot tying are often overlooked by steelheaders but ultimately are the most critical factors in landing steelhead. Tippet material should be newly bought for the season since it can degrade and loose knot strength over time. Water logged tippet spools can degrade tippet prematurely and should also be replaced. Using lighter tippet sizes may translate into more “hook-ups” on the tributaries when dead-drifting flies (since critical “drag-free” drifts are easier to achieve versus using heavier tippet) but fragile tippets can easily break during sudden steelhead runs and surges (more moderate action fly rod blanks can help prevent this though). Also, steelhead gill plates and streambed shale ledges and rocks can easily shred light tippet. A good strategy to land more steelhead consistently is to simply use heavier size tippet material (3X-2X versus 4X-5X) that has a higher breaking strength and compensate for the influence of the stiffer/heavier tippet on fly drift. A “loop knot” fly-to-tippet connection as well as concentrating on executing dead-drift presentations properly both can counteract the drag effect of upping your tippet size. 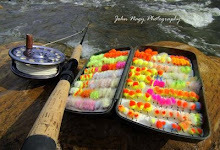 (Note: Be aware of possible hook “tear-outs” when using heavier tippets and small hook sizes. Effective fish playing techniques and forgiving fly rod blanks can prevent this). Another bonus of heavier tippets is the boost in abrasion resistance that normally goes along with using heavier mono or fluorocarbon materials. This comes in real handy when you’re fighting a trophy size steelhead that takes a sudden run along some shale ledge rock or razor sharp shelf ice! Finally, proper leader, tippet and fly-to-tippet knots should be standard procedure for the steelheader. This often goes by the way side when the steelhead action gets hot and heavy (aka: steelhead fever). This is a mistake, since most steelhead are lost due to poorly tied knots that either “slip” or break. More detailed information on steelhead fishing in the Lake Erie region can be found in John Nagy’s book “Steelhead Guide, Fly Fishing Techniques and Strategies for Lake Erie Steelhead”. 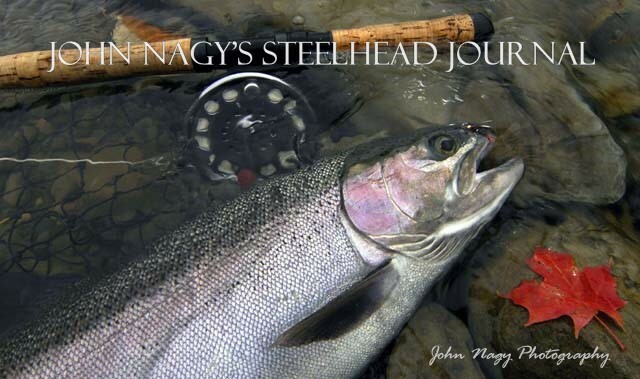 Steelheader’s looking for a detailed way to keep track of their steelhead adventures should check out John Nagy’s new book the "Steelheader's Journal".